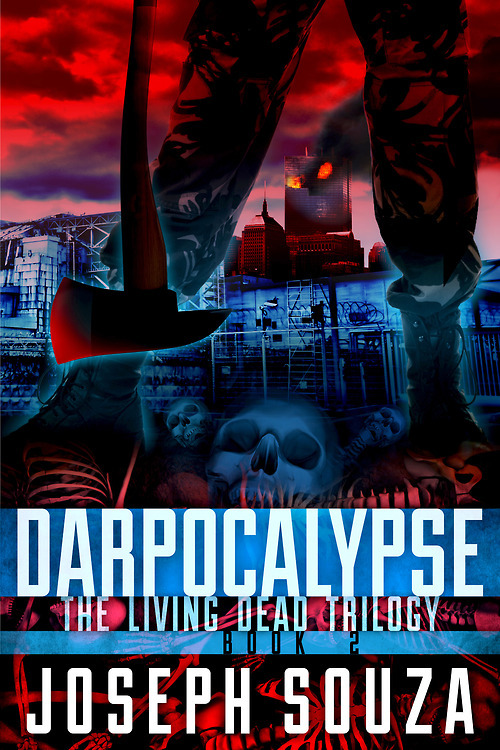 Darpocalypse, by Joseph Souza, is the second installment of The Living Dead Trilogy. The title character is Dar, a teenage girl who floundered in life before the zombie apocalypse and flourishes in the aftermath as a brutal warrior and merciless leader. Under Dar’s reign, the remaining residents of Boston live and work in a fenced-in area of the city as the zombie hordes relentlessly roam and moan outside their gates. It is a recipe for disaster. Souza’s first novel served as a cautionary tale against genetically modified food. His second focuses on the lengths people will go to attain and keep power. While Dar battles to keep control of Boston, the President of the United States remains in control of the Washington, D.C. settlement. That is until Mike Brabas, a convicted domestic terrorist, decides to take over both Washington and Boston. Add in a spy the President sends to Boston to steal their greatest asset, and the zombies recede into the background as humans once again prove they are a bigger danger than the zombies. One of the things that made Souza’s first book unique was his interpretation of zombies as half-animal half-human hybrids that retained their animal qualities, such as flight. In this novel, they have transformed into normal, shuffling, slow-moving flesh eaters, which, in some ways, make them less terrifying than his original concept. The religious angle from the first installment continues with the phenomenon of the newly departed coming back and speaking of religious matters before transitioning into zombies. Unfortunately, these scenes were few and didn’t serve to raise the intrigue or tension of this story line. My suspicion is that the payoff will come in the planned third book, but may have been better served in bigger doses in book two. Of the major story lines, the one that followed Dar was the most interesting. She is a strong character, governed by the whims of a teenager and the hormonal imbalances of a teenaged mom. The scenes where wrongdoers are called to judgement in the Pit caused conflicting emotions of hating Dar for her blood lust, while feeling empathy for this girl who finds herself responsible for the life of a community. This responsibility, while readily accepted, still seemed an overwhelming burden and one that absolved Dar of some of her worst offenses. Though the action driven plot moved along at a good clip, the Washington, D.C. characters and scenes seemed more generic and predictable than expected. Perhaps someone who doesn’t read and watch as much apocalyptic and military conspiracy theory as this reader would not have the same opinion, but, for me, the Boston part of the story carried my interest and kept me reading. Overall I preferred the first book, but, as in most trilogies, the second and third books have a higher expectation to meet. For me, this did not meet that expectation.